Barack Hussein Obama was born in 4 Aug 1961 in Honolulu, Honolulu County, Hawaii to Barack Hussein Obama, Sr. (born in Nyanza Province, Kenya) and Stanley Ann Dunham (born in Wichita, Sedgwick County, Kansas). His parents had met while both were attending college at the University of Hawaii. His parents divorced and his mother remarried while Barack was a young child — his father returned to Kenya. Stanley Ann Dunham married secondly to an Indonesian man and the family went there to live for a time. It was decided however after Barack had lived there for some few years, that he would be raised by his maternal grandparents in Honolulu. So at the age of ten he went to live with them, while his mother continued living in Indonesia with her then-husband. It was in Honolulu that Barack finished his primary schooling. Barack met his father once when Barack was about 18. His father died in an auto accident when Barack was 21. Barack's mother Ann was born 29 Nov 1942 in Wichita, Sedgwick County, Kansas and died 7 Nov 1995 of breast cancer in Honolulu, Hawaii. Barack moved to Chicago where on 18 Oct 1992 he married, at Trinity United Church of Christ, to Michelle LaVaughn Robinson who had been born in Chicago on 17 Jan 1964. They have two children, Malia born 1998 and Sasha born 2001. 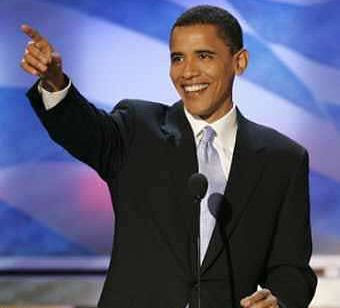 While running for US President, Barack was a US Senator from Illinois. He won the US Presidential Election of 2008, and was inaugurated in January 2009. His Democratic challengers for President were: Joe Biden, Christopher Dodd, John Edwards, Dennis Kucinich, Hillary Clinton, Bill Richardson, and Mike Gravel. On William Addams Reitwiesner's research page, we can see how Barack Obama is a descendent of Martha Eltonhead. This page was last modified on 27 December 2012, at 17:47. This page has been accessed 51,567 times.